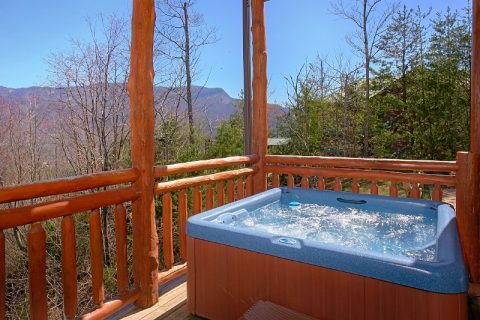 Experience "Pool And A View Lodge," a luxurious 6-bedroom cabin only a short drive from Gatlinburg, TN! 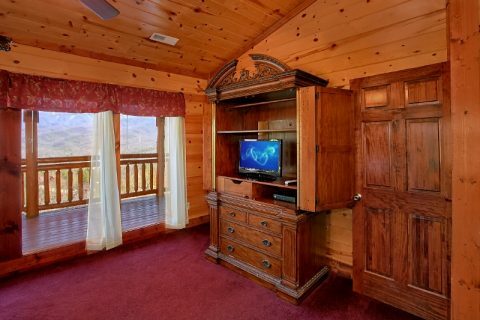 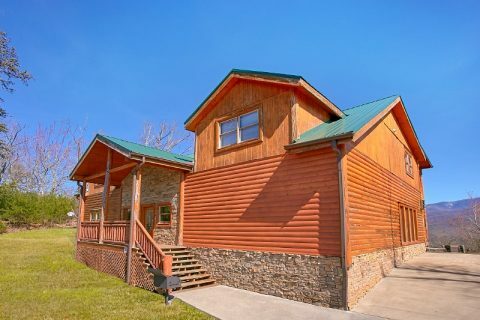 This group cabin in Gatlinburg's peaceful East Parkway area offers a truly lovely mountain view and access to the Greenbrier and Cosby entrances of the Great Smoky Mountains National Park. 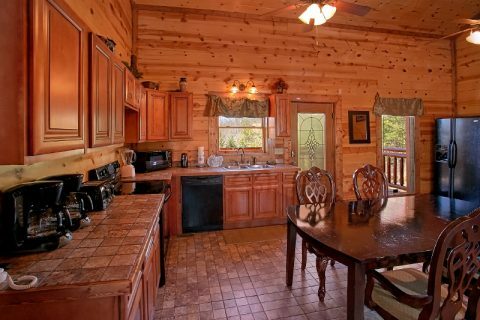 With room for up to 24 guests, this cabin can easily accommodate large groups with ease. 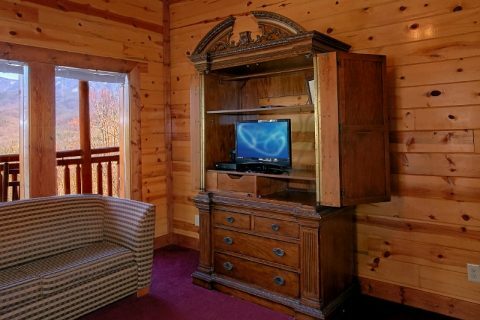 Better yet, this premium cabin comes complete with excellent amenities to make your stay a true delight. 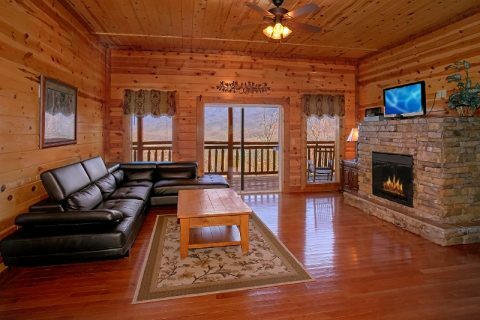 The main living room area is a great place to gather with the people who matter the most. 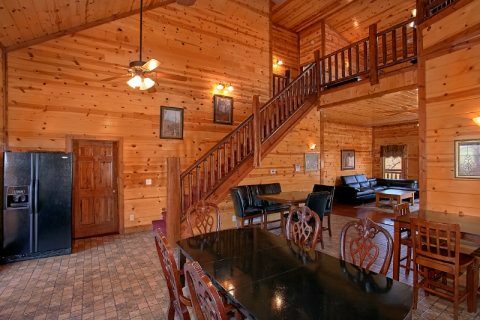 Enjoy this welcoming room with tall ceilings, a stacked-stone, electric fireplace, and comfortable seating that offers a sneak peak of this rental's gorgeous mountain views. 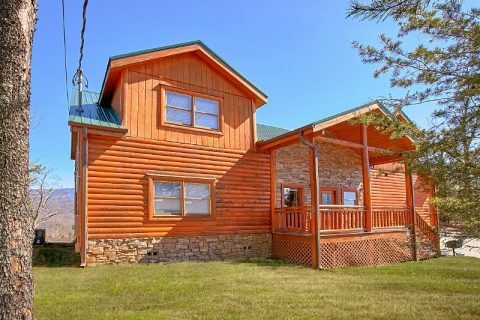 Step out onto the deck to enjoy the beautiful scenery while you sit back on patio furniture, rocking chairs, or the bubbling waters of your cabin's 6-person hot tub. 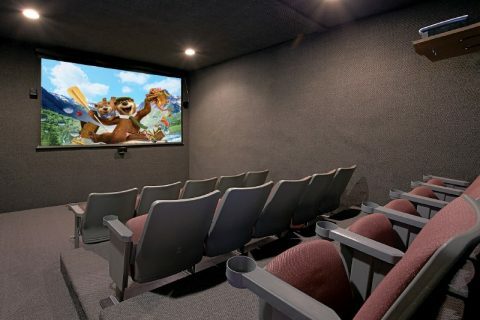 For a fun night of watching action movies in your cabin, there's plenty of space for everyone to gather in this cabin's theater room with a 9' projector screen, Blu-Ray DVD player, and theater seats. 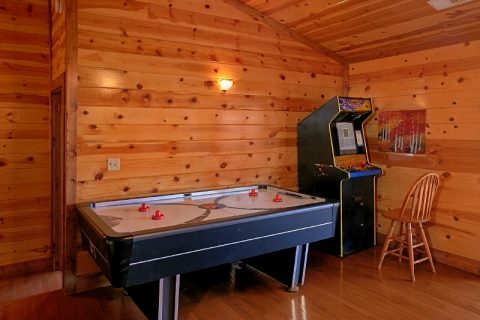 More in-cabin entertainment waits in the upstairs game room that's complete with a pool table, air hockey, arcade game, and ping pong table. 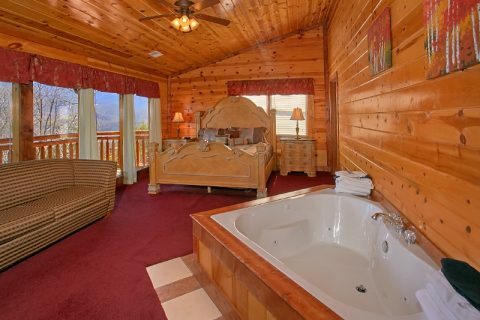 Last, but not least, your cabin boasts a private pool room with beautiful views of the mountains. 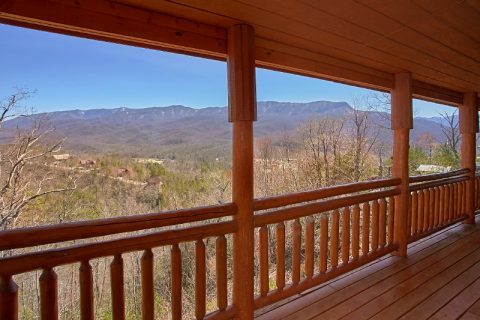 Enjoy year-round swimming in the privacy of your own mountain retreat! 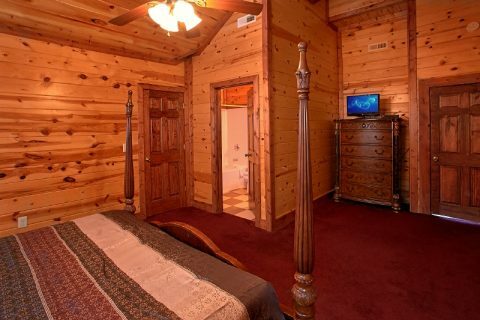 Your cabin provides a number of practical amenities as well. 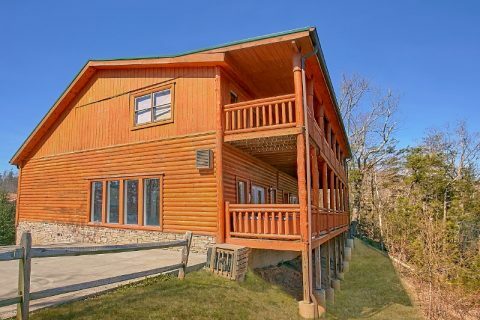 There's 2 story parking that offers plenty of space for 5 vehicles. 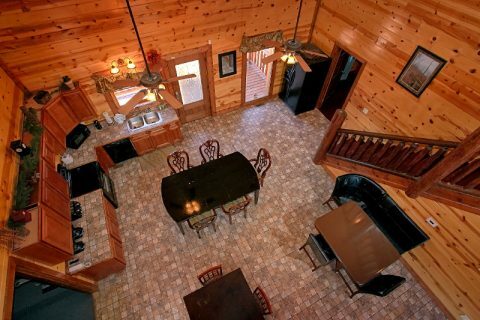 Your cabin's full kitchen and spacious dining area with 15 seats give you the chance to enjoy private dinners in your rental. 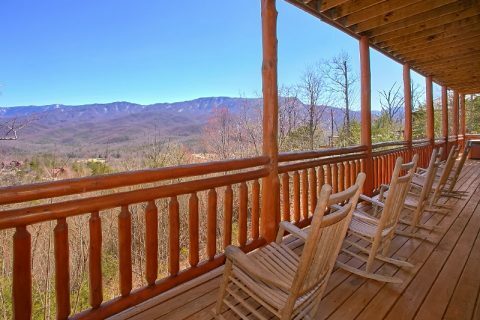 You can always fire up the charcoal grill to enjoy a laid-back cookout in the mountains. 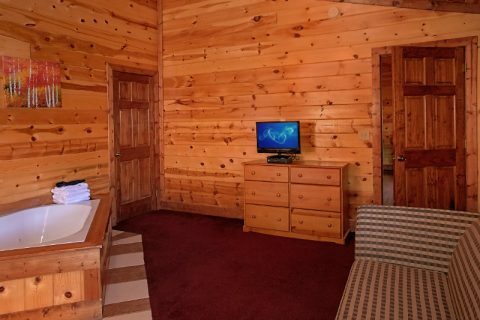 Lastly, a washer & dryer helps to keep your clothes fresh and clean during your stay. 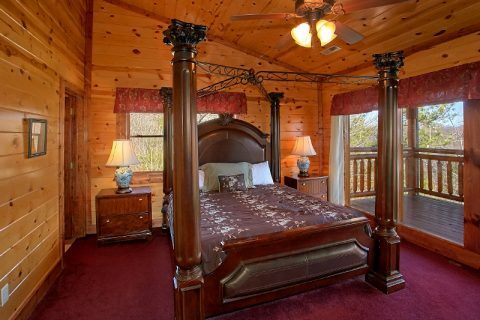 For staying well-rested during your stay, this 6-bedroom cabin provides plenty of comfortable sleeping space. 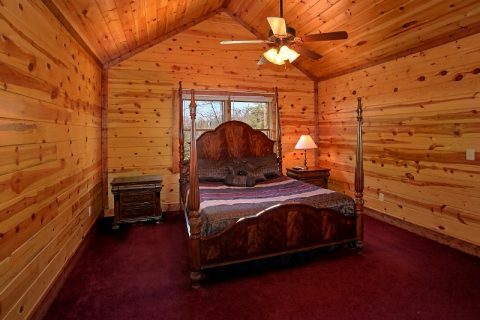 On the main level, you'll find two full bedrooms. 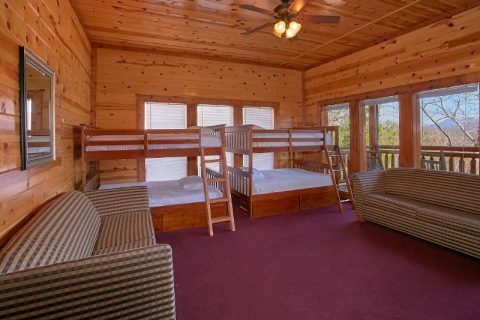 One boasts a king bed, flat screen television, and full bath while the other provides 2 sets of queen-sized bunk beds, 2 sofa sleepers, and a flat screen TV. 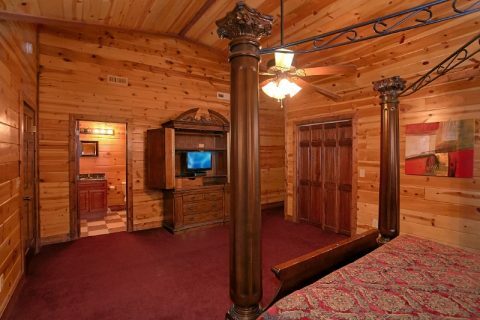 Upstairs, there are four more bedrooms. 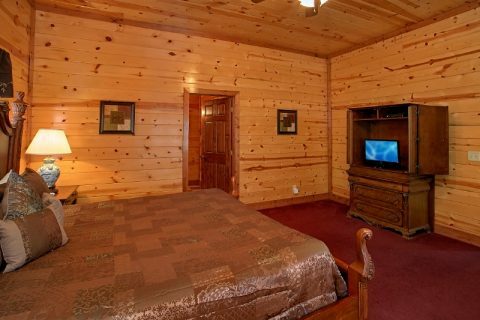 Three of these provide king beds, flat screen televisions, and full bathrooms. 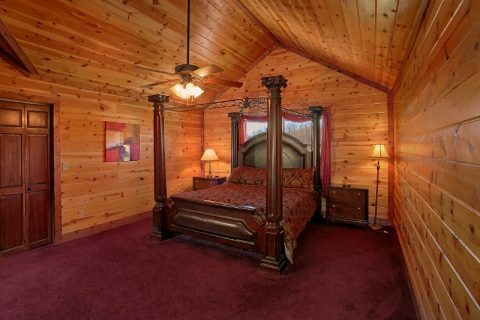 The last bedroom is a luxurious master room with a king bed, heart-shaped jacuzzi tub, private television, sleeper sofa, and full bathroom. 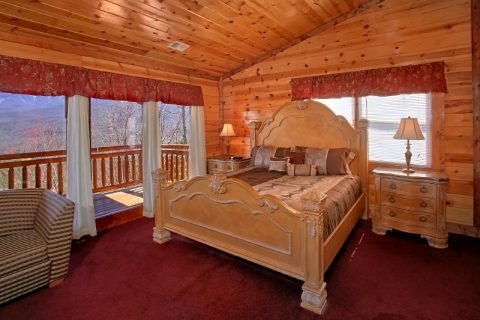 Reserve your lovely mountain lodge in Gatlinburg, TN to save 15% on your nightly rate! 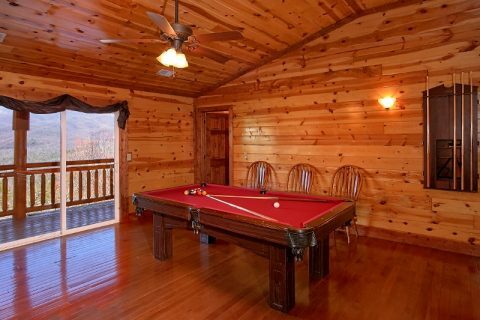 Enjoy a private pool, theater room, and a game room with all of your closest family and friends in the beautiful Great Smoky Mountains.